I always have a batch of home-made Gazpacho in the fridge during the summer. Full of raw vegetables and vitamins. It is refreshing and nutritious and a prefect dish to have prepared when the Madrid summer heat saps your energy to cook anything – let alone a full meal. 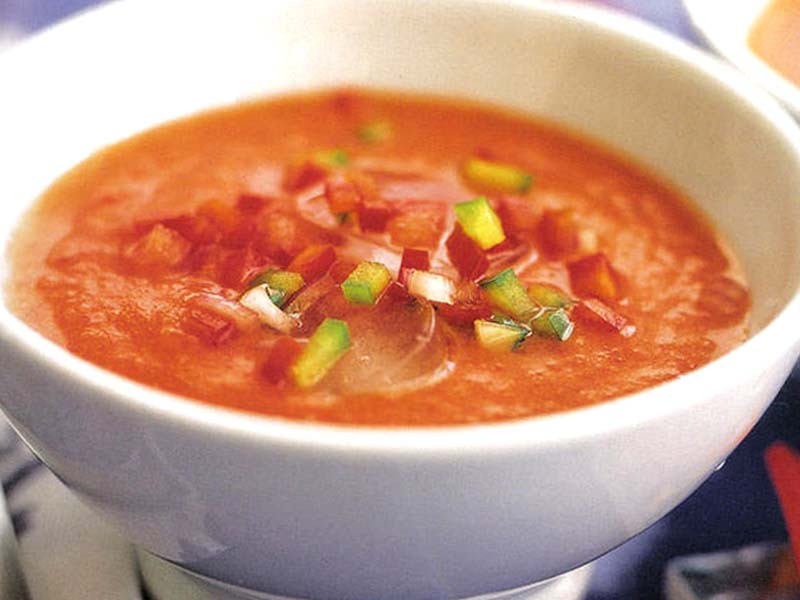 Gazpacho is a cold soup made from the ripe summer vegetables always cultivated in the vegetable patches of all Andalucian households. In Andalucia the tomato reigns in the summer, especially as when they ripen you almost always end up with a huge harvest. They are eaten raw in salads, even just on their own with salt, olive oil and chopped up garlic. They are used in sauces for fish and meatballs. As well as the tomatoes, the peppers will also play a part in a typical spanish sauce as of course do the onion and the garlic. One would think there was only one way to make gazpacho, but living in Spain I see many disagree on how much of each ingredient is needed. The main players are tomatoes, green peppers, cucumber, onion, garlic, olive oil and vinegar. The tomatoes need to be very ripe otherwise the soup will not have the flavour it needs and will be lacking the colour it should have. Traditionally there is and understanding that cucumber is less digestible without the peel so say they say to leave some on. In Spain the cucumbers are of a variety that have very thick skin therefore they are nearly always peeled apart from in this recipe. It does seem to vary depending on whether you add the tomatoes peeled and deseeded, whether you add bread either fresh breadcrumbs or day old bread soaked in a bowl of water. Some from Seville say to add cumin, and some add fresh herbs (I think this is a foreign idea and not traditional at all – it turns the dish into something totally different). There is also debate about whether you need a liquidiser or just a hand held blitzer. Originally it would have been made in the famous pestle and mortar that all spanish kitchens have. They would have pounded the garlic, oil and bread then added the tomatoes and other vegetables. There are some versions which are chunkier, more like a salsa. Then there are the versions which are very thin which have been put through a mouli. These days the ubiquitous blender is used. Often in the south you can find gazpacho served in a glass as a drink. Typically in restaurants in Madrid you’ll have it served in a bowl with an accompaniment of very finely freshly chopped vegetables to add to your liking and sometimes even small croutons. These days the hip and trendy thing to do with it is to substitute the tomatoes with fruit like watermelon or cherries. This is becoming very popular and is found often on restaurant menus in the summer in Madrid. I, personally I like the traditional version. I like to have it liquidised but not necessarily into a puree if I am going to eat it with a spoon, chunky and crunchy gives it texture. However if I am going to be drinking it out of a glass I like it thinner and more pureed. I like mine quite garlicky and the balance of onion, oil, vinegar and salt is most important. It need lots of olive oil, don’t be scared, it is needed to emulsify the vegetables and the bread. I prefer the lighter flavour of white wine vinegar too rather tan the red or sherry vinegar. On a large dish put some finely freshly chopped tomato, pepper, cucumber, onion and if you like some freshly fried croutons too. Put all the ingredients apart from the water and ice cubes into the jug of a liquidiser and blend until you are happy with the consistency. If you want in thinner and smoother add some of the water and blend again.